10 pp. Roman, 116 pp. Hausa cultural genres have surely undergone many transformations over the course of the centuries. The themes, modes of performance, modes of production, the role of authorship as well as the available technology have all undergone change. It is perhaps the cosmopolitan background of Hausa, the most widely spoken African language in West Africa – not only in northern Nigeria and southern Niger but also in both larger and smaller communities from Sierra Leone to the Sudan –, which has facilitated the development of its traditional cultural forms hand-in-hand with imported technology. The present work offers descriptions and analyses of recent changes in Hausa cultural genres affected by socio-political and technological developments. The question of survival and transformation of these genres is a key topic in this volume, explicitly discussed or at least implied throughout the work. Another major topic in the present work is the emergence of the new genre of love story (littattafan soyayya) in modern Hausa, in both written and visual media. These love stories originally appeared as novels towards the end of the 1980s, but could soon be found as videos and then DVDs. The first authors of this genre were women, and their male counterparts took up the baton and have continued to write on this theme. Other genres dis­cussed in this work include folk stories and chil­dren’s games, theatre and radio plays, novels, cinema, TV and videos and DVDs. This list is virtually a chronological inventory of these genres and corresponds closely to the direction in which development took place, a development heavily influenced by technology. 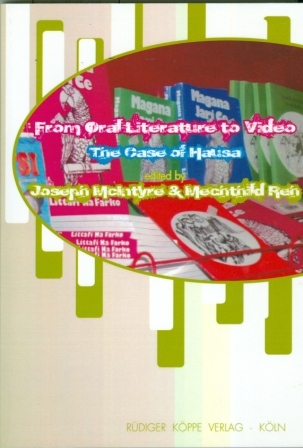 The following Hausa textbooks and dictionaries have been published in our programme, see under Accompanying material. Clicking on Cross-reference you will find further publications on African media cultures. Following the link at the bottom, you will find the full review text (pdf file). [...] the book is worth recommending to all interested in Hausa modern literature, films, music, and media, especially that it involves a “local insight” into the issues due to the fact that both contributors are at the same time the representatives of the Hausa culture.